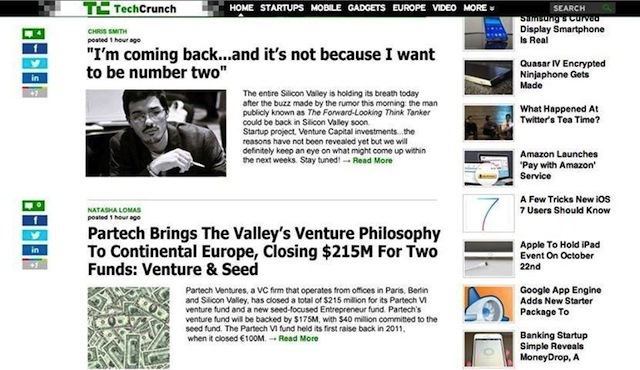 It has come to our attention that you recently used a fake, mocked-up version of our technology editorial “blog” property TechCrunch in a personal prank. Furthermore, it has come to our attention that your friend, a Mr. “Olivier M,” was in fact fooled by the aforementioned prank — or so it seems, based on the email entitled “Personal information in your website”, which was sent to TechCrunch Editorial “Tips” earlier this week (please see Attachments A, B, and C). Mr. Smith, as you know, AOL acquired TechCrunch back in 2010. Yet from what we understand, you failed to ask anyone at AOL’s Brand Group for permission to use our intellectual property. It’s possible that you’re sweating as you consider the legal ramifications of your actions, but don’t worry — you’ll note that this letter isn’t from AOL Legal. More importantly, contrary to popular opinion, we here at AOL Management have a finely tuned sense of humor. Indeed, we laugh long and hard every time a journalist makes a joke about dial-up Internet or CDs. We understand that such jokes derive their humor from AOL’s longstanding association with the aforementioned dial-up Internet and CDs. With that in mind, please consider permission to use TechCrunch branding and imagery to be retroactively granted in this case, because you are funny, subject to certain conditions (please see Attachment D). Indeed, you may tell your friends that AOL welcomes all use of TechCrunch branding and imagery for such friend pranking purposes, subject to the aforementioned conditions.